I wanted to write to you to personally thank you for the wonderful work Binding Broken Hearts ministry is doing. My name I Michael and I am currently incarcerated in Kentucky, awaiting transfer to the Kentucky DOC where I will serve a 12 year sentence without the possibility of parole. I have no real friends or family to speak of and until recently I believed all was lost in my life. Originally I was in Fulton County Jail. One day I came back to my cell from the recreation yard and I found a Binding Broken Hearts’ Bible lesson lying next to my bed. I read it, completed it and asked did anyone know where the Bible lesson had come from. Someone gave me the address and I requested to be added to your mailing list. And within a week the jail was struck by a tornado and 100 inmates were moved to different jails. I was brought here to Hopkins. I was extremely sad because all of my meager possessions, including my Bible, was lost in the tornado. I did obtain a small hand-held Bible, the little brown Bible with Psalms and the new Testament. So I began reading and studying God’s word, and then I was blessed to be housed next to someone who was on Binding Broken Hearts Ministry’s mailing list. I began reviewing his Bible lessons and using his Andrews New King James Version Study Bible provided by your ministry. Since then I have signed up for your Bible study lessons and to receive my free Bible which I am anxiously awaiting. I do understand that they are on a first come, first serve basis as your ministry has available funds for. But I just wanted to let you know that your ministry was the catalyst that placed me on my path of seeking a personal relationship with my Lord and Savior Jesus Christ. In the last five months (after being introduced to your ministry Binding Broken Hearts) I have been saved – born again, and have accepted Jesus Christ as my personal Savior and through the use of my cellmate’s “Study Bible” I have a new understanding of my Lord. The Andrews New King James Version Study Bible has been an irreplaceable resource. It’s clarity and detailed notes have increased my understanding of God’s Word. I want to thank everyone in your ministry and let you know that you brought me to Christ. I thank you and may God bless you and the work you are doing. You are in my prayers. Greetings and peace upon you all. I thank you all for sending me this Bible. Yes, I received the Bible y’all sent me. Thanks again! I’m writing in regards of my understanding and lack of faith. I come from a family of Christians and yes I was raised in the church. Lately I been the ability of God. I feel lost a lot of the times. I don’t know if I’m just going through a phase or what? I tried talking with other brothers in Christ but a lot of things I asked and I’m seeking didn’t get answered. I prayed and asked God to show me a sign that He hears me and I get called down to the chaplain’s office to be told my Grandmother that took part in my up bringing had died. It’s unfortunately that I prayed with a brother about my Grandmother’s situation before her death. Any how I was reading this letter you sent me and I came to the end where it said, “Meditation Prayer.” You asked God to help me recognize His love. It’s funny that, that’s what I’ve been dealing with for about a year or so now. I don’t know if He’s trying to get my attention or what but right now I’m so confused and this letter warmed me up and it felt like I know you all. I hope that I’m making sense because I’m not good at expressing myself. I’m working on it a we speak so I can be a better person. I don’t want to go to ell and I don’t want to live a life of evil I just want to know the truth so I can find my way in life. Thanks for you all’s time and I’m upmost appreciative of you all. Take care. I’m going to do these Bible studies hopefully I’ll see the light and my faith will grow strong again. Peace and love. I’m seeking insight, wisdom and truth. I want to thank you for the Bible you sent me last year and the monthly Bible studies and letters. I enjoy them very much. I am no longer at RCC. I am at a different prison and want to give you my new mailing info so that I may continue to receive them. The letters and Bible studies mean the world to me. I am serving life without parole and look forward to and gain a lot of direction and hope from your messages and scriptures. Thank you and God bless. Thank you very much for the letters you send. It’s important to me being at times it’s the only mail I receive. Do forgive me for taking this long to respond back. As I read your most recent letter mentioning spring time, made me realize just how fast this year is passing. Time waits on no one. Soon our Lord will return and bring us home. I’m trusting and believing that the same God as a trusted in will fight our battles too. Though I don’t see the behind the scene conflicts. I know he’s doing His part. Again thank you for your letters. They’re very encouraging. Keep them coming. I pray that our God continues to bless you all. I have enjoyed the Bible I received and the letters I get form you all, it’s amazing what you do for the ones locked up and I would love anything else you can send to help me with my walk with God!! I would like to know if I could keep in touch with you all when I get released from prison in 2017. I have come to find the Andrews study Bible very nice. I have used it through my Malachi Dad’s program and it has brought me to answer many question I could not answer without the wisdom of the Holy Spirit and God word that was wrote in the Holy Bible. I thank you so very much and God bless you both and to your corporation. Thank you For the letters and lessons. I'm excited about your ministry. God always proves himself, we just have the bad habit of not seeing his hand at work. I believe and sometimes, just wished it was all the time, stop, standstill, and I can see his hand at work in mine and others lives. We often get put through things and ask our heavenly father, why aren't you doing this for me now. If we'd stand still and try listening, we'd hear our father telling us it's not time. If we just stand still and watch we see that everything he does, has a purpose. As impatient children we often miss or rather Important point. He gives us our blessings and answers our prayers when we can get the most out of it but also when the situation is just right and he can get the glory out of it. I know Satan's hands very well, but I will not let him steal a blessing for me! All it means to me is that I will be even more blessed by your donation. Satan has done everything to deter me from serving God I'm even in a cell with a confessed Satanist, only I believe my presence and knowing, not believing, God Jesus and the Holy Spirit is real, he is now exploring other religions even more. He is hard to live with and deal with at times. I wish God would help me show him the truth! I don't know what God's plans for me are but I pray that he uses me in a way that blesses others and glorifies him! God knows my testimony, many heard me talk about it, but many want to argue rather than listen. I've learned a few have actually gotten blessed by my testimony. I just pray God will bless me with some happiness, with music. When I wrote and asked you guys for a Bible, I never expected a letter with such personal and open-hearted content. I just wanted and needed a Bible, and got so much more Your words are rejuvenating to my spirit, and imprisonment certainly has a tendency to draw that dark cloud making one feel they’re a lost cause. Then there are good hearted Christians such as yourselves. So, thank you so very much. I just had to write and say thank you and keep up the wonderful work you're doing. I can only imagine the many people who lives your touching. I received your letter and at the same time my Bible. I want to appreciate for this amazing gift. I am sure that this Bible will help me so much, because there’s no better gift received than the word of God. Especially for us, because we don’t have our family as company. I would personally like to thank you guys for all that you do for the less fortunate, and for people like me, who some feel aren’t deserving of such kindness!!! Thank you and may God bless you. Hello, I was blessed to receive a letter from you today. I still believe it’s awesome the way your ministry blesses prisoners with good study Bibles at no cost to them. There are a lot of ministries who offer Bibles, but they do it at a cost to the inmate. I know I have been blessed by my Bible from your ministry. It was nice to receive your/ letter and Bible studies and I want to thank you for putting me on the waiting list to receive a large print Andrew study Bible. I am looking forward to when it comes so I can use it to help me grow in my walk in Christ. I am fairly new. I gave my life to Christ in February 2015 while I was in the county jail and have been daily surrendering my life to him and enjoying the things he is doing in my life even though I am in prison. I know he has a plan for me and I look forward to the path he is going to lead me and even though I am locked up I feel free and there is a joy and happiness inside of me that I never felt before. I thank God for groups like you all and others that take their time to help people like me in my situation come to grow and learn and God and loved to help us become. I currently have just under 23 years left to serve in prison but I know when I get out I will be a better man than I was before I look back on all the times my family reached out to help me come to Jesus by asking me to get to church and doing things in the community but me being stubborn and hardheaded I thought I knew better and looking back I found myself trying to do things like go to theme parks or vacations to get out of them asking me to go to church. But I see I was hurting myself and then I realize a just wanted to help me but in the last two years God has led me through this journey putting me where he wants me and I am able to share with other inmates that God’s love for us is real no matter what were in here for or how long we are in here so I look forward to your letters. As I go through this journey God bless you and thank you. I know that you guys must be flooded with letters and paperwork, but I want you to know that I for one appreciate the time and energy that you put into the Lord’s works. I'm one of the inmates who you send the Bible studies to, and I'm writing to let you know how grateful I am. I’d also like to thank you guys for your unconditional love and care for inmates. May God bless you! I give glory to God that there are people who still spread the good news of Jesus. I am happy there is a place to help out prisoners who have no other ways to have materials sent in to them about Jesus. Thank you for the help of the Bible and I’m glad God has called on your ministries to help spread the gospel of Jesus Christ and to help those that are lost. You guys made me feel so blessed when I received the Study Bible from you all. I have not went a day without opening it up to read Proverbs or do my Bible studies. Thanks a million times from the bottom of my heart. I feel like you guys were put into my life for mental support and spiritual support. I can say you guys may have saved my life, literally! My name is Eric Rhodes, and I write to each of you today with an urgent request of the utmost importance. 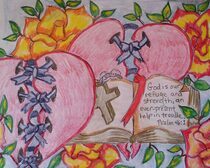 For the last past year I have been partnered with Binding Broken Hearts Ministry in which I have been truly blessed. As many of you know that Binding Broken Hearts Ministry is run solely upon two things: prayer and faith that God will meet their every need. The founders of the ministry totally depend upon God for everything that comes their way. I don't know how many of you who are reading this letter have been blessed by the study Bibles that they give out free of charge to anyone who desires to have one. I can only speak for myself when I say how blessed I've been by the Bible I have received from their ministry. As good as the Bibles are, they can't compare to the personal messages that they put into every letter they send out, which is about 4500 letters every month. And half of them have personal messages in them from those who write to them. You do the math -- that's a lot of personal heartfelt responses. I am very blessed to have a good prison job and because of it I felt led to pay my tithe from the money I earned. I average between $50 and $70 per month in wages from my job, and before I do anything else, I write my check to Binding Broken Hearts Ministry. Please understand I am in no way bragging about the job I have. In fact I am very humbled for it. I don't know how many of you reading received the project update letter from Binding Broken Hearts Ministry, but as I read it, the letter broke my heart. As I mentioned before, Binding Broken Hearts Ministry is solely based upon prayer and faith, believing that God will meet their every need. They have a huge financial need. So I'm asking you my fellow brothers and sisters in Christ to partner with my new Broken Hearts Ministry just as I have done for the past year. I know that many of you who are reading this letter may feel like what you could give wouldn't help. I would like to remind you of the Widow in Luke 12:42 who didn't have much, but who gave from her heart to God. If the 4500 people who received a monthly letter from buying Binding Broken Hearts Ministry could give just $1 per month, that would be $4500 a month which would go towards helping Binding Broken Hearts Ministry to be able to not only bless anyone who desires to have a Bible but also the persona; messages that are included in the letter their Ministry sends out every month. I urge each one of you to take a leap of faith by helping Binding Broken Hearts Ministry with whatever you are able to give even if it is only a small amount like the poor widows two mites. As long as it comes from the heart God will bless you for it. May God bless you and keep you may his face always shine upon you. I have a story to share with you, a story of divine intervention. Some folks might not see the event as monument, but it certainly was significant to me. This prison has been open for seven years. During the first five years we had plenty of Bibles for whoever wanted them. The emphasis on having Bibles to hand out was lost. For the past two years it became increasingly difficult to get a study Bible, and then even non-study Bibles became difficult to acquire. Over the past year I had several inmates write to the chaplain to get Bibles to no avail. One wanted large print because he has cataracts. The private medical contractor refuses to spend the money on the cataract surgery and the unbeliever cannot read smaller print. Another inmate wanted to study Bible and none was available. For the past year I have been discipling inmates in one-on-one Bible studies. I have become more acutely aware of the need for a good study Bible and for large-print Bibles. I had several discussions with a fellow Christian on what we might do it to meet this need. We prayed over this need. A Christian friend of mine, Ed Snell of Faith Outreach, a small organization of about 30 people was recently speaking to me about bringing a Christian singer into the prison. This small group of people with modest means would pay the bill. I said to Ed, we need Bibles. For the money that it would cost to bring in a singer, we could get a lot of study Bibles. On February 11th, I was at an inmate service, when the civilian speaker Bert Eldridge told us about people in churches offering to pay for books to send into the chapel at this prison or offering to defray his gas cost to drive here from Casper. But he has turned them down stating he would pay for his ministry himself. When Bert made the statement . . . I couldn't wait to get to the end of the service. I was going to approach him to ask him to request other churches to donate Bibles to us. The service got over and I was just starting to stand up to go see Bert about getting some Bibles donated, when an inmate made an announcement out of the blue. Inmate DD stated if anybody needed a study Bible he knew of an organization that donates study Bibles. Then he told me about you. My jaw dropped. Two weeks earlier I prayed for a solution to no Bibles being available. A week later I asked a friend to donate Bibles instead of bringing in a Christian singer. For a month I had discussed this problem a number of times with a fellow Christian. I was leaving my seat to go ask the preacher to fill that need. At that precise moment God said in his still small voice, hold on there Mark. I got this covered. I have been going to church every week for seven years and nobody has ever said that they knew of a place that inmates can get a study Bible donated. The timing was not coincidental. To me this was no lesser a miracle then curing a disease. Inmate DD showed me his new King James Study Bible in soft leather, or a material like leather, that was in large print, published by Andrews. It was a very nice Bible. Is this the only Bible you offer or do you have other Bibles available? Do the inmates need to pay any money to get the Bible's? Do you have any criteria for inmates to get a Bible from you? Do you have any information about your organization available? I encourage you to have the inmates write you directly if they need a Bible rather than a book donation of Bibles to the chapel. If an inmate has to write you a letter he has to make an effort. This will weed out some of the people who would just pick one up and never use it. Additionally our chapel has limited storage space and I've been informed that donated items sometimes are then given away. Thank you for your time have a blessed day! Hello from Florida. I do pray as this letter finds you all are well at your home. I pray that God’s loving hands are always wrapped around you protecting you from the storms of nature and life. Here? As good as can be, under the circumstances of this trial of life that I must journey through! What a beautiful blessing! We must face each day with joy! Yes, we must endure our battle, Jesus has already given us victory every day. We can allow our trial to make us stronger, or we can flop in the mud of wickedness like a fish out of water. I desire to rest in the assurance of Jesus' arms. When we are reminded of our past, our pride, our joy, our stupidity in our journey, we can come to a complete understanding and knowledge of all that Jesus has done for us, his forgiveness, his love and mercy. We are forgiven. We can and do have another chance in life, if we will only reach out and submit. I have learned from my mistakes, of putting God last in my life, being lukewarm, writing offense, disobedience. Not no more! I will never forsake my God my Savior again. As I told a younger one in here, I can only get strength by continuing to be in his presence. I stand on Psalms 91:12. I love it, his promises are real this I know! Well my friends I thank you for your time and letter, I do pray that my letter brings you the joy that your letter produces for my heart. I do pray that our heavenly father will bless you spiritually, emotionally, physically as well as financially, and your life’s until our next talk together, again I thank you! So very much for your lesson and letter. I just wanted to thank you for restoring me back to normal. My resources to acquire Bibles and spiritual reading material with limited during my transition from jail to prison. As I told you before, I also lost my first Bible during my transfer. Unfortunately, the jail I was in declared it a weapon and confiscated it and put it in my property. I had to find humor in it being a weapon for we both know it really is!!! Amen! When I study, I'm more productive. I can read the large print and the cross reference. So please know that your obedience and love for our father in Heaven has not come back void. I've been blessed with many miracles of Christ anointing and I look forward to forever. I hope we can continue correspondence through the next few months. I've been encouraged and edified by your ministry and I don't have too many family to grow with in Christ. Plus, I love to hear about your family especially your pets and their day-to-day presence... I don't want you to misunderstand me, I have family who love me very much and they are Christians but I do have a bad past and I'm afraid it's going to take time for healing, so they kind of don't want me. I'm a 48 year old man and I can't blame them for my past. So, I'm also finding that the desire to follow Jesus is not the going trend these days. As far as the prison I'm at here in Florida it's looked upon as a weakness and a waste of time. I've been revealed the truth at this behavior. Apostle Paul and Peter both convey the message that the God of this world has blinded the unbeliever to the light of Christ and Peter says that they think I'm foolish that I don't conform to the wicked ways that they practice. So, I guess what I'm trying to ask is if we could share our faith and experiences because the elements here of this person feels like a brood of vipers and I'm still a babe new in Christ. I'm also excited and attracted to the word and to my growth in Christ's family. Once again, I thank you for the gift of my perfect Bible and I pray that peace and favor during bring joy to our lives and Jesus. I look forward to your letters and love you all. First and foremost I hope that when you receive my letter you all are doing well both mentally and spiritually and can’t forget about physically. I really want to thank all for being so consistent with your letters and blessings you all send to us. They seem to arrive at the most needed of times. Thank you. I want to let you know that I've received a Bible thanks to God! I hardly receive mail anymore and I am only 24 years old and incarcerated on top of that! But in due time I will be home, and thank God for that. Right now I’m currently in the box, hole, whatever you want to call it. Over here at the prison that I am housed at we are locked down 24 hours a day inside a 6 x 9 cell. Prison life is a whole new world when compared you being free on the streets. I don’t let prison change me or make me feel locked away. I used to a couple years ago until I found God. He set my spirit free so now no matter where I am where I go I am always going to be free. I hope you know it really means a lot to me that I can write you and tell you about my day and you know that you take time out of your day to read this letter means more than words can explain. I wish I could get some people to do that! But you all are really a blessing and may God bless you today tomorrow always and forever. Thank you for listening. Hello my brother and sister in Christ! How are you guys doing? Happy new year and God bless! I was writing to inform you that I received my Bible and wanted to personally thank you guys for your tireless commitment to changing lives. It was such a blessing to finally get my Bible and open it. I read every morning for about an hour and I’m getting a more complete understanding of different Scriptures and for that I’m extremely grateful. I just wanted to encourage you guys that the work you all are doing is definitely changing lives. With people like you out there ones like me would not know the love God has for us. My Bible is one of my most cherished things and my life with God is never been so great. For all this thank you for being here for all the ones that you have helped getting them Bibles and letters so that they know and I know that there are those ones out there who cared about us and don't throw us away as we are called and treated by prison staff and others as scum and dirt that doesn't deserve anything from life. God bless you all and you are in my prayers always. Well hello family, how are the blessing coming you? I pray that the best is in your favor. As for me, I’m on the next road towards home. So I’m feeling very blessed right now. God is good. Am writing to you guys because I’ve been moved from one summer county jail and sent to the penitentiary. This place that I’m at is better than Sumner County, but it’s not my last stop. This is just classification. So I’ve got one more stop, then it’s homeward bound. But thank you guys for sharing the thrills of home with me. Conan’s and bad boy but old Tim is still king. It’s amazing how you guys can still have fun at your ages, and always see the best of life. That’s how I want to be in life, and at that age. So I’ve asked God to give me the heart and faith of you all. I found myself trying to share more of God’s word with people. I’m also finding myself in the best of spirits. I give my all, I pray more, and try to keep a more positive attitude. So I thank you guys for being a family to me. I was in tears after your prayers for me. Because I felt a weight be lifted off my shoulders. I feel the protection that God has around me. And every time someone comes around me with an evil vibe, I go get someone’s Bible to read. Before I know what’s going on, I’m talking to them about God. Most of them go away, but the ones that stay make me happy. Because I can talk about my father to them, someone that’s making a difference in my life. So thank you family. Also thank you for one story about the young boy. It made me laugh and cry at the same time. I often get choked up over God. The Bible does have some good stories in it. So I can’t wait to have my own. Because I want to outline some of the stories and sayings like I see in other people’s Bibles. So I’m waiting on God to come through for me. I can’t thank you guys enough for being there for me. Until we speak again. May our father continue to bless us all. The best has yet to come lots of love. Hello my brother and sister in Christ! How are you guys doing? God bless! I was writing to inform you that I received my Bible and wanted to personally thank you guys for your tireless commitment to changing lives. It was such a blessing to finally get my Bible and open it. I read every morning for about an hour and I’m getting a more complete understanding of different Scriptures and for that I’m extremely grateful. I just wanted to encourage you guys that the work you all are doing is definitely changing lives. I got your letter and Bible study today I was so happy to receive you all’s letter and the Bible study thank you. The word means so much to me. Since I wrote last time I’m out of the hole. I’m in a really good room with just one bunky she is really great to talk to about God and how he is a part of every action in our lives. Again really feel and see God working great in my life and now he has put your family and friends in my life God is good! Your mail is so great, your words of wisdom about God makes my hungry more and more and the study Bible you all sent me gives me great wisdom. Thank you for helping me with God’s word. Well the weather has been nice and warm and great guys like God is helping me be thankful for all my blessings. Well I will keep all you in my prayers and have a blessed day and month I will keep you in my prayers every day. I know that the Lord is amazing. He has been blessing me so much. I look back on my time in prison and see all the wonderful things he has done for me. I thank God daily for all those who work to bring his word to us and others. I have come to understand that, good or bad God has been here leading me where I do not know I just know I have really changed in some ways and still work and others. Yeah, one thing has never changed and that has always been that I love to take care of people. I spent my life trying to take care of others we forgot to take care of self. Through prayer and studying God's word I found how to balance both. I have made a huge mistake and am paying for it as far as man is go. But, I believe God saw my heart and no I never meant for anything bad to happen. I am so loved by Jesus and the father. But I have over the last 17 years been reunited with the ones I love. We may not see each other face-to-face but I do get letters and pictures not as much as at first but it's been a blessing. I just want you all to know that because of your love and sharing of your life story of day-to-day happening I can and do see a brighter future for me. I have seen and felt a part of something bigger. For everything you all share with me has helped me to see how God has been and is working in my life. Thank God for wonderful, peaceful, loving caring people like you all. I can never never begin to tell you how much each letter means to me or how I wait like a child to be fed. Not only your sharing of your life but that of the word of God. Sometime when I feel down I read over the letters and Bible study I have and I find that God is so cool. Because I laugh about the cats or think about how beautiful it must be there or one of the Bible study is what I needed to get me through whatever it is I'm going through. Thank you again and God bless you all for brightening a life. I would like to ask you all to keep me uplifted for the more God is working in me the more people around me are trying to bring me down. I do not know God's plan for me but I know I am waiting and getting ready. I will not turn and run from my Lord and Savior not this time. God bless you all and may we meet in the glories come of our Lord Jesus amen. Could you also pray for the people who I am trying to help and who are looking for peace and God undying love. I have helped other over the years and did not know that was what I was doing. So now I know God has been there using me for a long time even if I did not know it was him. Thank God for opening my eyes. But I was blind and now I see. I will keep praying that God bless all who work and share his word with others. God is doing big things behind these walls. Every day our Bible studies grow! At least one of your Bibles is at every meeting. The Lord’s love is filled the hearts of every man here. Racial tension is less daily, Blacks, whites, Hispanics, all creeds join hands every night at 930 for a prayer circle. (Prayers go up, blessings come down!) Each wing here at St. Joseph Missouri holds up to 82 men. Our prayer circle usually has 3250 of those men joined hand-in-hand! We are a band of outlaw sinners, yet through reading and Bible study your ministry has helped us learn that we are redeemed by the blood of Christ Jesus our Lord! That in turn has transformed our behavior. I am a recipient of your monthly letter, as well as one of the beautiful Bibles from BBH. I wanted to take time to write and thank you both for the personalized letters, and all the work that you do for your ministry. I also want to thank Bert and all the folks that volunteer their time and donations to make the BBH ministry a success all for the glory of our Saviour, Jesus Christ. The personalized letters are a nice touch, and mean a lot to me, as well as many inmates, not only at this facility, but many others as well. I read and study the Bible several times every day have begun observing the actual Sabbath. I also am just finishing an intense study of God’s Holy days and feasts. I love hearing about your lives, pets, families, etc. There is so little to look forward to in prison. Your ministry and testimony to us means a lot. May God richly bless you all for all you do. Hi brother and sister in Christ! How are you and family? I pray that all is good and is sitting in the care of God. I am doing good because God’s good to me! First of all, I want to thank you all for your letters of concern (thank you) they are so inspiring to me and up lifting my spirit. God Scriptures declare that it’s heroes were made strong out of weakness. Therefore my life as troublesome as it may seem is made strong through my fires or lion’s den. I once had a misunderstanding of this concept, but the Holy Spirit now confirms this truth to me. Romans 12:1-2 tells me that it’s my responsibility to live holy for the Lord, and then says that I can accomplish true obedience by a transformation of my mind set (praise God). So I believe that my situations and circumstances are the things that teaches my mind to trust God’s words than by faith I’m able to overcome anything in the mindset of Jesus Christ. Philippians 2:5 states let Christ's mind be in us. So, I’m rejoicing and praising God the father for all he’s done. I pray that God continues to strengthen your ministry and the people that are involved. I love you all in Christ. Ms. Judy and Mr. Bert tell Ms. Sharon that I said hi and that it’s super hot down here it’s been around 93 to 94 every day. But God will provide a means of comfort for us! So you all be safe and keep me in your prayers please and I’ll do the same for you all. Just reread your letter of May 23rd and as always enjoyed hearing from you. All of your letters have a full meal in them. A taste of the outside, the bread of Gods Word, and the dessert of family. Thanks. Yesterday I went to property control and picked up the Andrew's Study Bible that your organization made possible. It was more than I could expect as I got it to my room and look through it with all of the references and study helps it has. I know I'll gain a lot of understanding as I read. Please thank everyone involved with your organization that made this possible for me. Your descriptions of Wyoming in both the mountains and plains sound so beautiful, and to think it's only a prelude to the beauty of Heaven. I enjoy all of your letters and they both make me feel free and inspire me to be the lamp that you three are. Thanks. I don’t know if you remember me or not but in October you sent me one of your beautiful Bibles and in November sent me a knowing Jesus Bible study book. I love them both and I daily use on my path to follow our leader brother Jesus. A giant thank you for being there for us helping get the word out and for bearing witnesses to the truth. You both have inspired me to dedicate my life to further my studies in the Gospel of Jesus Christ. My prayers are with you daily and I know this is a God oriented ministry so if God for you then there are no one richer than our father, so daily just thank him, and praise him for meeting your financial obligations, and he will not disappoint you at all. You’re distributing the most powerful treasure that this world has ever experienced. While the world is spiritual of new threats that hit nation against nation God’s word is and should be the greatest bearer on the hearts of man, or his word can tear down kingdoms, build up kingdoms, change hearts, break chains, and set The street. So when our father owns all the cattle on all the hills, and the hills to, keep the faith, and hold on to the never changing hand of God, he will honor your faith with blessing. How are you doing, while I pray that you are doing okay! As for myself, I’m truly blessed by the best! I got your letter and I’m truly happy that you took the time to write to me thanks. You touch my heart to have found out that the love of Christ still live in us whom love him. Prison can be a depressing place when we as inmates don’t have anyone to share that love of God with. Yes we can spiritually learn to have a personal relationship with the father himself. But even Adam was not left alone and was given a helpmate, someone whom was compatible of sharing the love of God with him! However though, we aren’t never alone, but the human part of me, longs for love. I thank Jesus for the word being read by us whom have his spirit, we are alive and we know that we have a greater gift waiting us in heaven! So thank you Mrs. Judy and Sharon for just thinking about me now may the love of God continue to lead and guide you all, I love you all and Christ Jesus. I just wanted to write you a short letter letting you know how much I appreciate your monthly letters and lessons. God bless you guys for doing this! When I first started getting your letters was when I was still in a county jail, the letters and lessons really help me focus on what I need to focus on that is a Lord and family and friends like yourselves. I believe I will be at my current location till I’m release which will be in the summer of 2021 I try not to dwell on the outdate so much. I just want to take the time I have here and better myself. I know the Lord has a plan for me and at times I’m not sure what it is but what I do know is he wants me to do the best I can no matter where I’m at again I want to thank you guys for your wonderful letters and lessons. I look forward to them! It took me long enough to write to you and I apologize but I have been quite busy, however I think you would approve my distractions. I am currently taking three classes that keep me quite busy and study as well as my daily devotion to my Bible studies and our evening Bible study I believe I told you about. Speaking of my Bible studies and Bible study group, I gladly received the Bible from you today! All I can say is wow! And thank you! I also thank God for your ability to send them out. I wanted to mention how the Lord has been blessing me and my Christian friends. By us witnessing and ministering to others and the newcomers, we have brought a lot more into our Bible study group and I also have a couple guys that study with me with the study materials I get from the Bible college through the mail. I’m holding my own, as I said, I’m staying very busy with the classes, studies, and prayer. I’m waiting for a book to arrive that teaches American sign language so I can also study and learn that. I figure with the Spanish and the sign language I could and would be able to minister to more people. I really want to do missionary work in this country and South America and Latin. Unless of course, God has a different plan for me – which I will welcome with as much effort devotion to it as any plan I might try to do. God is my guide and teach! I guess I’ll stop here for now as it is getting late I do not want to miss the mail collection to go out in Friday’s mail, they do not do weekend mail. Again thank you so very much for the most awesome and most welcomed Bible. It is so much more than I expected, trust that it will be put to good and constant use. Please keep in touch as I will too. Keep the stories coming and thank you for the study material I received from you too. God bless you all you are still in my prayers. I'm serving a 20-year sentence for a drug conspiracy charge. I wanted to tell you a little about my testimony and in doing so I am requesting for a large print NKJV Study Bible if you have the funding for it. I am grateful believer in Jesus Christ. I am a saved Christian since I was 8 years old. I have been arrested on the charge in 2010, then released awaiting Federal indictment. While I was in Harnett County Jail, a volunteer from the outside brought me a Bible because I had been very suicidal and needing to hear the Lord's voice to find a reason to live. I asked her where to begin reading first and she suggested John. So John it was. I began reading and as I read, I went and I wept, I was so overcome by sadness that I had never experienced before. I call it a Jesus sadness, like I think he would be for us. When I read about what we as a people did to Jesus and how much he loves us, when he should have wanted nothing more to do with us, but yet he died upon the cross, where we should have been for us that our sins should be forgiven and when he was set free. I could not understand was he would die for a wreck like me or why God so loved the world that he gave his only begotten son, that whosoever believeth in him shall not perish but have everlasting life. I began to walk the floor and pour out my confessions of sins, with tears and words uncontrollable. I was cleaned up on the inside or at least the process was beginning for me to be a new creation in Christ. This process lasted for several hours. Then I had a severe thirst for the word and my Lord and savior's love! Two months later I had been questioned and questioned by authorities and told I was looking at 10 to life but if I cooperated I would probably only served four and a half, so I got overcome with fear and started to lose Faith. Oh my God had won me back and he was not going to let me fall away again so as I sat on my bed in Brunswick County jail with the devil trying to make me suicidal once more, my God wrap his loving arms around me and began to Rock Me! The most wonderful and amazing feeling of love I have ever experienced in my life. As my tears dried and my entire body was filled with warmth and beautiful feelings, he whispered to me, child why do you cry out why do you doubt? You are my daughter, the daughter of the king. That makes me a princess and therefore you are very worthy of love and so you should love yourself and never want to kill yourself again! And praise God since that day, those words and the rocking in his arms, I have never had any more Suicidal Thoughts! I am the daughter of the most high God, I am a royal Priestess. I deserve to live as such! And since that moment you can't say or do anything to make me doubt or not give praise to God, my Lord and Savior and to tell the world of all the good news. I am still thirsty for the word and all I can learn from it and I would really love to study the Bible to help me through this process to know my Lord and to hide his word in my heart! Thank you so very much. May the Lord bring blessings down on your ministry. To my friends Bert, Judith, and Sharon. Good morning to you all, I hope and pray that you are doing all right. I want to thank you for sending a Bible study lesson book. “Knowing Jesus” is really helping me draw closer to my Lord and Savior Jesus Christ. It’s helping me to study the word of God more and more every day. Even though I’m doing the best I can to do God’s will in my life. I still have this one major stronghold that won’t let me go. I want to be honest with you, I really enjoy this sin but at the same time, I know in my heart it’s wrong. I need your prayers. Please pray that God will take the urge from me. Thank you for your prayers. Anyway other than that, I want you all to know I really love hearing from all of you. Your letter encourages me so much. Please don’t stop writing me. Please keep sending me Bible studies, lessons to help me grow in the Lord Jesus. God is a good God, all the time. I know he has a purpose for my life. I’m 50 years old. God has carried me a lot of those years when I didn’t know him. Now that I know him personally as my Savior I want to be all I can be for his glory. I want to reach out to as many lost souls as I can for Jesus. Please pray that God will put that burning desire to win souls for him. I stand on the word Jeremiah 29:11 and Phil 4:13 and second Corinthians 5:17. I am not going to give up I promise. I want you all to know, I love all of you as a brother in Christ and where all in my prayers night and day. God bless you and thank you again for being a friend it means so much to me. I have questions about other religions, Christianity in particular. I'm considering a different religion but there are so many others and they each have different beliefs. I'm confused about the more deeper aspects of Christianity. Like for instance, how do you call Jesus, godson, God, to me it's like calling the prince king. Since God never ends or dies how can Jesus be God? How can God be himself, Jesus the sun, and the Holy Spirit? Why do I need to believe in the son to be forgiven by the father, or why should I pray to Jesus, and not directly to God? To me, praying to Jesus is the same as praying to Mary, or even one of the other things or Apostles? I don't have a Bible but I have read it several times, so I'm familiar with it. Since there are so many versions, how do I know the Bible isn't just a story made up by the church or a bunch of men? How do I get paid for this thing you call Salvation? I don't believe in instant forgiveness by God. Especially not for a Satanist. I see it like this, I'm from the other side, why would your general just trust me and forgive me for all the acts have done? He wouldn't! Neither do I believe God would either! I believe God's forgiveness takes a lot of prayers and time. Help me better understand how this is supposed to work. I believed all my life that Jesus was just a man, not the actual Son of God, and if he was, why would I have to believe him to be forgiven by God? Remember, I've been a Satanist for 50 years, it's hard for me to understand things you might take at face value. I've been taught and practiced things completely opposite to your religion works. Can you help me understand the Bible better and show me how your religion works? I'll need a Bible, whatever Bible you use will be helpful, thank you for trying to help me. Thank you for writing, it really means a lot to have people like yourself to care over thoughts, feelings each day, through our Lord Jesus Christ. I'm aware of how hard the struggle is for you all day in and day out, no matter how hard the road blocks maybe, he always gives you all the strength to carry on. Yes he has enabled me to share words of knowledge to those in need, it doesn't matter if we are in prison or not, helping those in need is what it is all about, each day I try to share what I know and hopes that it will help just one person, if it helps more than one great. Whenever the Bible comes in, it will be a blessing to receive one, and I shall honor it because it came from those who care. I also would like to thank all of those who help you spread the word of God, my prayers are with you and for you all. I really enjoy the letters you guys send me feel the love you to have for the ministry. I want you guys to know that your work is not in vain. It may seem overwhelming at times, but the work that are doing is touching thousands of lives. From your little rural headquarters in Buffalo, Wyoming you are touching the whole world. The Lord is raising up a battalion of men in and which cannot be bought or bargain with. Men who are tired of conforming to the world and have rebelled against the world in love. We know that love is the main weapon of our warfare and that the world would know us by it. Thank you for being a light in a dark place and a voice in the wilderness. You are in my prayers. In the name of Jesus I asked that all your needs be supplied and that everything you guys touch be multiplied. May you prosper in everything you do and may you feel the peace and joy of the Holy Ghost every day till that day which we wait on. First and foremost, thank you both for taking the time to convey the Lord’s word, and the salvation that is possible. Blessed every day I am. Even in this miserable run detention center I find the Lord constantly at work within some of us and He, without fail, allows is like to work through us. I, myself, have completely surrendered all to his will. He is my breath, my comforter, through the Lord I’ve been renewed to accomplish all things with his spiritual strength. Acknowledging his power and purpose and all he directs me to do. There has been a group of us that have sustained a daily or Saturday nightly prayer call. Through the few attempts to stop this positive and needed fellowship by officers and demon filled persons, we have continued to become stronger, and gaining or losing, Christian brothers, the Lord has blessed us with spiritual maturity that has allowed a handful of us to lead many to Jesus. Any given night there could be 20-40 individuals, with one accord holding hands, singing, praising, acknowledging our Savior, magnifying our God to any problems or circumstances. I personally have witnessed hundreds of manifestation of God’s power within these walls to the point of officers either requesting us to pray for certain situations in their life, or even a good handful joining hands with us and praying with us. I as everyone in C pod has recognized that closer of distance between officer and inmate. So much respect is shown to them for showing their courage and faith in Jesus. Continually hold fast to the word that we are our brother’s keeper. I have personally seen the Lord operate over and over in the court room. I don’t believe the 300 or so that have faithfully trusted in God, received the sentence they were expecting. A dramatic sentence reduction to the point that even officers are noticing whatever the reasons of most of the outcomes of court from those in the circle and does not, we are all thankful, and even the most doubtful and disbelieving are looking at the door that goes to the prayer circle yard. At 10:15 PM every night, at least one out of three people who see us giving it up with tears of joy and blessing, are hit with curiosity and walk through the door. Truly, I say, it’s amazing to see God’s power and love move within some of these men that fall to their knees, shaking, crying uncontrollably, completely broken, asking for the peace and comfort that only comes from our Savior. I’m so glad that I can share your letter with these individuals showing them there are people, God’s people, out there in the world who also believe and care about us, yes, us. The lowly people drug addicts, thieves, murderers, pushers, sheets, abusers and so on. I attempt to explain to help others that we are the ones who Christ Jesus came to save. Most see when I show them actual Scripture, that no one but Jesus was without blame, and Satan uses the doubt that creeps up inside us when we swear or lie and what not. But every day we must present ourselves, to carry our cross and bring our confusion to the father, and ask for forgiveness, and repent. Their understanding for many are being blessed in ways that they can only say it was by God. Okay, I hope your letters keep coming, and I will write from the prison I go to. I was finally sentenced after 14 months, and I did not receive the 15 years I was supposed to get or the possession and sales of firearms – assault rifles. I ended up with 30 months. I nearly fainted because I was already told by my attorney I would expect the 15 years at best. Thank you for praying for me and JO. Okay a little about myself. I’m almost 50 and don’t feel but 30 if that. I have five grandbabies who, my wife and I have raised their entire life. There 12, eight, six, five, 13 months born in Florida, raised in Bakersfield, California Moved to Missouri in 2007 to get away from the gangs and drugs that were invading Bakersfield. So I quit my job at four years for Kenia oil drilling and moved out to Missouri. Started a concrete company out here and lost it due to my trailer and every tool, aluminum form etc. was stolen. So then I went back to professional tattooing, opened the tattoo studio in Republic Missouri called insane tattoo, which is still operating today, though I have washed my hands with the studio due to illegal activity since I’ve come to jail on February 15, 2015 on a federal indictment. I would like to go to Bible college upon my release and actually spread God’s word. I will write again when I get to the federal prison and would very much like a Bible. God bless you. There is so much I wish to write you. I only hope I get it all in here without losing my train of thought or boring you to tears. I suppose the most important and pressing is my eternal gratitude and appreciation for your wonderful gifts of the Study Bible you sent me. Since words cannot convey just how grateful I am, I plan on showing you by the use I put it to. Please share with all in your ministry and church my words of gratitude as well as my words of encouragement. You all are in my prayers; May our Lord bless you all in your lives and in the work you od for Him in His name and for His glory. I feel that the world needs to be made aware of how large an impact small ministries such as yours has in the lives of those they touch upon and bless. In a prison ministry such as yours this is especially important as I feel prisoners are oft forgotten by the majority of otherwise considerate Christians. This is sad for not only the prisoners who need ministry as much if not more than others, but for the ministers who are missing out on numerous ways to serve our Lord's cause, that would enrich the spiritual lives of those behind bars and in their own lives, churches, communities, etc. Hail to the King of glory and righteousness, our Lord and Savior Jesus Christ. First and foremost, please allow me to apologize for not responding to your first letter. I have been kind of down in the dumps and got a little reclusive. I would like you to know that your letter lifted me up and brought me back. It gets pretty tough and here, especially when you are in the circumstances I find myself in. I don't get much personal mail and I really am impressed that you take the time to sit down and write letters to People Like Us. I can feel the love and loyalty of and for Christ in your words. It's funny how God uses crazy situations to express his love to us. I thank God that I was given your address and was told to write. I don't believe in coincidence or chance. I know that our creator plans every millisecond of every day and every event. Thank you for your obedience and faithfulness to the calling that God has set forth for you and your ministry. When I originally wrote you, it was for prayer and a Bible, so let me just say that I definitely wasn't expecting a personal response. Much less two! So let me spend a few minutes to tell you a little about myself and my situation. I'm going to start by saying that I hope I continue to hear from you and I promise that I'm not some weirdo trying to get an upper hand. I asked for nothing other than your continued prayers and steadfastness in Christ. As you know already my name is CT. I was born in Orlando Florida. My mom dumped me on my dad's doorstep when I was 6 months old, leaving dad for a drug dealer. My dad did the best he could, which was fantastic considering what he had to work with. I never went without. I was raised in a home where Christ was not existent. I had absolutely zero spiritual upbringing. To make a long story short, I started running the streets and fell in with a white supremacy gang, call the crazy white boys, C.W.B. And before long I was in trouble .In and out of jail and prison due to violence and drugs. My Poor Dad tried so hard. Fast forward to March of 2011. I went to a club meeting at our clubhouse in Ocala Florida and got pretty wasted. By now I already had quite a reputation with the local cops. I was one of the biggest methamphetamine manufacturers and highest-ranked member of my chapter. Upon leaving the bar I was pulled over for drunk driving, literally 300 yards from my driveway. It just so happens that the deputy that pulled me over was the same that had there watching me and trying, to no avail, till then to bag me. Finally he had me. That is what he told me. Well once he had me in handcuffs, him and his buddy started to beat me up. I was actually knocked unconscious at one point! Fast forward again, to cover up their blatant abuse of power I was charged with two counts of battery on a law enforcement officer, One count of resistance with violence, and DUI and sentenced to 12 and a half years in prison and one year of probation to follow. From that moment forward I had a lot of anger towards God and all authority. Kind of God would allow that to happen? Where was the Justice? I lashed out at all the Christians I encounter, occasionally with extreme violence. I hated their makeup, and stolen Traditions. I hated their hypocrisy. I hated everything to do with everything they stand for. I became a high priest and a pig and religion and of course started running with all the white boys again. Here I am, in prison and living the same life I was living on the streets. The only tie I had with the outside was my baby sister Patsy and then on July 20th 2014 she committed suicide. I really lost it. A Christian in the door mentioned praying for me and I snapped. I beat him with a Master Lock and is 60 days in the hole. I was so eat up with demons that I had no understanding. All I knew was that this New God killed my sister while I was serving and unjust prison bid. Fast forward again, again war broke out in prison, I was at and I answered getting a transfer to Florida State Prison. Where I'm currently at in August of 2015. It wasn't long before I was with the same type of crowd doing the same atrocities. Then I got called to the chaplain's office. My dad, my rock, my best friend, died at 54 of a brain aneurysm. I was devastated. I lost all track of reality. I vaguely remember the chaplain praying for me, but I was so hurt and alone and then know that at the time and that nothing. Well I have never been so miserable and alone as I was then. As I was lying in my bunk on February 18th, I broke down and said a real simple but desperate prayer, God if you are real, then I need two things, some answers for starters and a sign that you even exist. I awoke the next morning refreshed and actually hopefully. That I was called to my classification officers office and that's when God answered my cry for help. I was told that my custody dropped and would not be going outside the confines of the prison, without shackles, to work during the days. Now this may not seem like much But trust me, it is. My time just got drastically easier. This is a place of Highly trusted and favoured convicts. And I'm now working as a mechanic for the prison. Well I was a lot of things but an oath-breaker wasn't one of them. On 2 - 20 - 2016 I gave my life to the Lord Jesus Christ. And in that short period I have been delivered of a 20-year drug addiction, successfully renounce all hidden ties and have more favor with the guards that should be possible. I am at peace. For the first time in over 20 years I am truly at peace. God has done a miracle and transform this week and heart. I have no family and no friends out there in the Free World but I have the love of a mighty God to sustain me. I am currently enrolled in a college Christian Seminary school and do numerous Bible studies. Everybody here calls me the modern-day Paul, haha. All I do now is study the Bible, go to Chapel, and go to work. And I'm in God's game now! Free and clear. Remember me saying that I didn't believe in coincidence? What God has shown me that there was a purpose behind all the things I went through. And I'll work to the good. It led me to a relationship with Jesus Christ. I've used my testimony to lead others that would like me to Christ. All the years that I wasted, running from God landed me right into his loving and merciful arms. I feel more free in here, the most people out there. I am due to be released in 2023 and I have nowhere to go and no one to go to, but am more than confident that God will establish everything. The more I rely on him and stand on his promises and Faith, the more he truly amazes me with his mercy and compassion. I have an old paperback KJV Bible with the front cover missing that I found in the chapel. And it stays open with my nose buried in it. God's word has become my meat. And I can't get enough. Today I thank the Lord for the work he has done in me. He took a loss sinner, who rejected and ignored his call at every turn and created a vessel for his service. I love to give my testimony and share what God has done in my life. I have prayed for God to use me and I try hard to be a model of what he wants. I believe that God has placed it on my heart to minister for him and pray constantly for the Divine wisdom and guidance to do exactly that. I believe in Jesus! John 16: 16 is my favorite verse and I often refer to it during the day. Oh by the way, I was saved on 2/20/16, look up 2:20 of Galatians it couldn't be more appropriate. Don't you think? I want to thank you again for your letters. It's nice to receive mail every once in awhile. It's certainly a complete blessing. I pray that God continues to bless you and your ministry. Your devotions mean a lot! Just wanted you to see what our Lord and savior has done for me. Miracles still happen! I'm proof. I hope to hear from you again. I welcome all the mail I can get from brothers and sisters in the Lord. You will be in my prayers and I will be looking forward to the Bible that I know the Lord will soon provide. May the love of Christ continue to dwell in you! © 2016 Binding Broken Hearts, Inc.